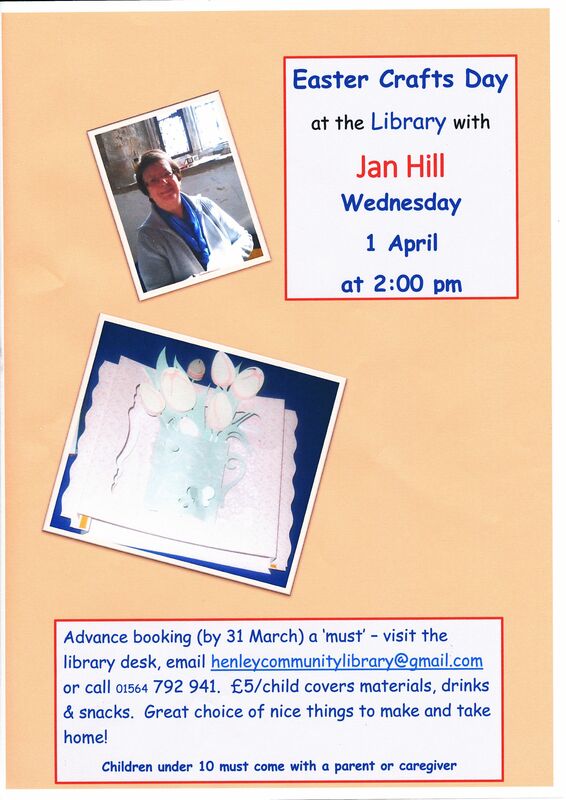 On Wednesday 1 April, Janet Hill will be holding an Easter Crafts workshop in the Library. Children can make something nice for Easter – a basket, a bag, a framed picture, a bouquet of tulips or perhaps a lantern (battery operated tealight). Cost is £5 per child (additional siblings will be charged £3). The workshop will start at 2 p.m. It is suggested that children under the age of 10 be accompanied with an adult or caregiver. Advance booking please by 31st March. Enrol either by emailing: henley.community.library@gmail.com, telephoning 01564 794885 or 01564 792941 or signing up when visiting the library.